Mary Palmer had lost a case against a trustee of her husband’s estate who sought to buy her interest in the estate. Chancellor Robert R. Livingston ruled against her. Hamilton handled the winning appeal. The decision found that a trustee with power over the estate could never be a purchaser, a principle “founded in indispensable necessity, to prevent that great inlet of fraud, and those dangerous consequences which would ensue” if trustees were allowed to pursue their own interests perhaps at the expense of the estate. ALEXANDER HAMILTON. 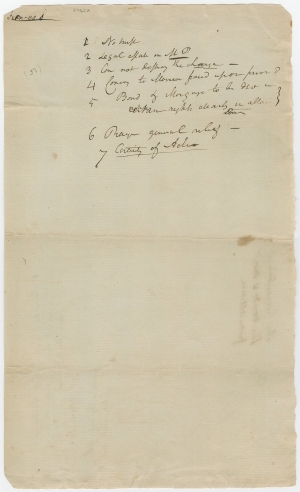 Autograph Manuscript, seven points on one page with Hamilton’s additional citations on verso, n.p., n.d., but early in 1796, relating to Peter Jay Munro et al, appellants v. Peter Allaire. 1 p. plus additional Autograph notes on verso. In 1796 Alexander Hamilton represented Peter Jay Munro before the Court for the Trial of Impeachments and Correction of Errors (the predecessor to the New York Court of Appeals) in the case of Peter Jay Munro, Benjamin Griffen, Isaac Sniffen, and Mary Palmer, the younger v. Peter Allaire. In this case one Benjamin Palmer of Mamaroneck, New York left a will instructing his executors to sell all his estate within a year after his death. After payment of his debts, a small bequest was left to his son and the remainder to his wife Mary Palmer and her heirs. The will named his wife as executrix and Griffen and Allaire as executors. Isaac Sniffen subsequently offered £450 for Palmer’s interest in the estate, but Allaire also wanted to purchase the interest. He negotiated with Palmer, who then agreed to sell her interest to Allaire for £600. Allaire then entered into a bond to secure part of the purchase money. Munro and Sniffen responded by procuring a subsequent conveyance of the estate from executor Griffen and executrix Palmer. Munro took possession of a substantial portion of the estate and refused to account for the conveyance to Allaire. In 1795 Allaire filed a bill in Chancery, seeking an accounting (payment) from Munro as per his prior agreement with Mary Palmer. Sniffen and Palmer and Munro and Griffen filed general demurrers to the bill for want of equity. We were unable to find in the records an explanation for Palmer’s fighting for the lower offer, but she was by the time of the appeal reported to be gravely ill, and appears to be arranging what today would be a reverse mortgage. We believe immediate payment from Sniffen, even for a lower amount, was more desirable than a promise of payment from Allaire. In February 1796 Chancellor Robert R. Livingston ruled against them. Following an appeal, Justice Egbert Benson held that Allaire, as a trustee with a power over the property to be conveyed, could never be a purchaser, a principle “founded in indispensable necessity, to prevent that great inlet of fraud, and those dangerous consequences which would ensue, if trustees might themselves become purchasers.” On March 21, 1796, the Court of Errors reversed Livingston’s decision and ruled in favor of the demurrers. It is perhaps no coincidence that Livingston ruled against Munro (Hamilton’s client) and the other demurrers, as by that time the Livingston family and Hamilton had been at odds for years. In 1789 the New York State Legislature selected the state’s first two U.S. senators under the new Constitution. As head of the powerful Schuyler family, Philip Schuyler – Hamilton’s father-in-law – was a given for one of the two posts. 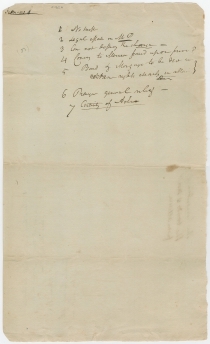 Schuyler in turn promised the mighty Livingston clan that he would support New York City Mayor James Duane (who had married into the Livingston family) for the second post. Yet Hamilton, worried that Duane’s successor as mayor would be unworthy of the position, decided to oppose Duane for senator and threw his support to Rufus King, a native New Englander who had recently moved to New York. With King’s election on 16 July, a rift was formed between Hamilton and the Livingstons - a rift that only deepened when Hamilton and none other than Robert R. Livingston both pursued the position of secretary of the treasury, with Hamilton winning the prize. 3 Can not defray the charge. When a devise even in trust the Deviser or heir at law may come in and have the estate. This was the case of the resulting Trust. Case summary from Julius Goebel Jr. and Joseph H. Smith, eds., The Law Practice of Alexander Hamilton: Documents and Commentary, Volume IV (New York: Columbia University Press, 1980), 25-26. Ron Chernow, Alexander Hamilton (New York: The Penguin Press, 2004), 285-86. James Farquhar to Alexander Hamilton, 21 July 1795. In civil procedure a prayer for relief is the portion of a complaint in which the plaintiff describes the remedy or remedies that said plaintiff seeks from the court. Generally, the plaintiff makes a special prayer for specific relief to which he/she believes himself/herself entitled, and then concludes with a prayer of general relief at the discretion of the court. A devise is 1) the act of leaving property in a will, 2) such a will, or a clause in such a will, or 3) the real property left in such a will.